Why is our villa so special? Our home offers the guests the best facilities you will find in a vacation home. Maintained to a high standard throughout, you will find that home from home feeling when you arrive. We have had over forty five star reviews from Trip Advisor. We have a great location, close to Disney and Disney Springs with lots of places to eat and shop nearby. Closesttothemagic have been providing memorable vacations for over ten years with many returning guests. We hope we can provide a wonderful vacation for you too. 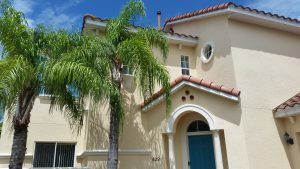 Our beautiful Tuscan-style villa is situated on the gated community of Tuscan Hills, one of Orlando’s most impressive communities. Set in an landscaped courtyard, your home is is of a higher specification to many other homes in Florida. We have large pool area with spa, and you are not overlooked by another home, so plenty of privacy! A big news item for 2018 is the introduction of parking charges in Disney for overnight parking. This follows Universal application of parking charges. Disney are charging up to $25 per night for guests staying at their own resort hotels. Closesttothemagic do not charge for parking. As we say…no hidden charges, the price you see is what you will pay. Our 2 storey villa is larger than the standard Orlando rental villa, and is ideal for parties of up to ten people. The living room is open plan and very spacious leading to the dining area and kitchen. Great for families who like to congregate round the breakfast bar and plan the day. The lounge is beautifully furnished and has a 50″ LED TV. There is also a separate toilet and washbasin on the ground floor. We have had the whole of the externals of the property re-painted, and had the pool deck refreshed. 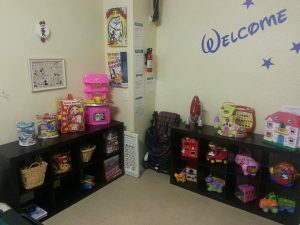 New carpets throughout the whole house for 2019, and our recommended feature, our “Toy Corner” for our younger guests featuring Fisher Price and Early Learning Center toys. Master bathroom incorporating walk-in shower and separate bath. Upstairs master bedroom with King size bed with large walk in shower. Beautiful large 26-foot by 13 foot heated pool and heated spa. You are not overlooked! Our home is level access in many areas and helpful to guests with limited mobility. Extended deck area and shaded patio – whole area screened. 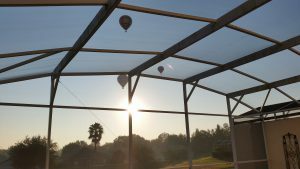 Watch the hot air balloons from Championsgate float past while having breakfast. Complimentary use of large pushchair, high chair and large crib and linen. We have a stairgate to make sure your child is safe. 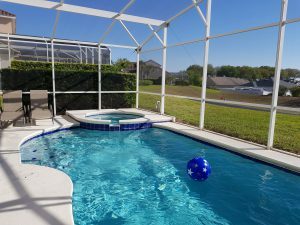 The pool area is screened so your children can play safely on the patio area. We have Netflix set up in the home, so you can watch all your favorites while you are at the home. 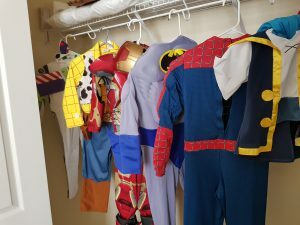 We have Princess and Super heroes dress up for your little ones…..
Berry Town Center is a half mile away, which has Publix, Applebees restaurant and our regular Chinese take-away. Use of all resort activities, recreation area, volleyball, tennis and large clubhouse with gym and games room. All our prices include taxes, so no hidden extras! Free parking!!! ok that sounds like a joke, but Disney resorts are now paying per night to park. On a two week stay that is up to $300! We don’t charge you to park and staying in a villa is a more cost effective option than resort stays. Why not message Closesttothemagic on Facebook? Closesttothemagic & Magic Connect are trading names under Macron Properties Ltd.